Rev up your motorbikes and ride close to a thousand kilometres on this 12-day motorbiking trip of Spiti Valley. With an entourage of daredevil riders, you'll follow an expert road captain and ride through the spellbinding landscapes of Spiti. En route, stop by the world’s highest post office in Hikkim and pay a visit to Komic, the highest village with a motorable road in the world. Ride across high-altitude passes, including the famous Rohtang pass, and delight in the gorgeous views of snow-capped Himalayan peaks. You'll also spend a tranquil night camping under the bright starry sky, near the beautiful Chandratal Lake. Please note that the price displayed is the per person price for booking of one motorbike rider and one pillion rider. Spiti Valley is a cold desert nestled over 12,500 feet in north-eastern Himachal Pradesh. Your 12-day motorbiking adventure in Spiti gives you the chance to witness the changing landscape, from the lush, green valleys of Manali to the brown, barren mountains of Spiti. Under the clear blue sky, you'll ride on rough hilly roads with snow-capped mountains rising high all around you. Your motorbiking expedition begins from Manali, one of the most gorgeous hill stations of India. Soon, your route will take you on thrilling adventures, from visiting the last inhabited village on the Indo-Tibetan border to splashing about in the emerald green lake of Nako. Completing the circuit, you'll end your expedition back in Manali. • Explore Spiti Valley with a pack of passionate motorbikers. • Stop by the world's highest post office in Hikkim. • Travel through sky-scraping Rohtang Pass and Kunzum Pass. • Camp under the starry skies near the Chandratal lake. • Visit Komic, the world's highest village with a motorable road. • Stop by breathtaking Buddhist monasteries with fascinating artwork. Travellers will be required to pay a refundable security deposit of INR 5,000 per motorbike. Any major damage or loss to the motorbike and use of any spare parts will be deducted from the security deposit. This deposit is payable directly to the tour operator and any disputes involving the deposit will be settled between the tour operator and the traveller. Travellers are only allowed to store one rucksack of maximum 60 litres capacity in the support vehicle. Any extra luggage will be the responsibility of the traveller. Today you will meet your fellow riders at the Volvo bus stand in Delhi by late afternoon. You'll board a semi-sleeper AC Volvo bus which will take you to Manali. It will be a fun-filled overnight journey of approximately 12 hours. Overnight in transit. After reaching Manali early in the morning, you will immediately check into your pre-booked hotels to relax in the pleasant weather. Today, you can spend the day visiting some of the popular tourist spots in Manali, like the picturesque Hadimba temple, Vashisht temple and Tibetan monasteries. You can explore local cafes for delicious food on Manali's Mall road. Later in the day, your bikes will be allotted to you with a detailed map of your itinerary. Overnight at a hotel in Manali. A delicious breakfast will be served to you in the morning. Your biking expedition starts from today; begin by riding 233 km towards Sarahan. En route, you'll visit Rampur, which is a small commercial hub in the mountains. By evening, you'll reach the little Sarahan village. The village is well-known for the quaint Bhimakali temple, built with fascinating Himachali architecture. Overnight in tents under the starlit sky in Sarahan. Today you'll ride 83 kms to reach the lush green valley of Sangla. You will enter the Kinnaur district to reach Sangla, which is flanked by snow-clad mountains of one side and the Baspa river on the other. Overnight in a hotel at Sangla. Travel 24 kms alongside the Baspa river to the next destination, Chitkul, the last inhabited village near the Indo-Tibetan border. It is also the highest altitude village in the Baspa valley of Himachal Pradesh. Explore the small village in the evening. Overnight in a hotel at Chitkul. 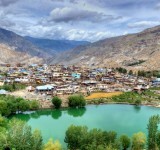 Your destination for today is Tabo, a small town on the banks of the Spiti River. You'll leave from Chitkul and move towards Reckong Peo, the headquarters of Kinnaur district, and then ride uphill to reach Kalpa, a beautiful town at the base of Kinnaur Kailash mountains. En route, enjoy view of Mt. Reo Purgyil, the highest mountain peak in Himachal Pradesh. You'll then ride towards Nako, famous for the Nako lake surrounded by willow and poplar trees. You may visit the four Buddhist temples that surround Nako Lake and continue to Tabo. Overnight in a hotel at Tabo. In the morning, you'll ride a short distance to Kaza, the largest town in Spiti Valley at an altitude of 12,500 feet. Kaza is decorated by snow-clad mountains and the gushing Spiti river, with multiple beautiful palaces, monasteries and gompas. Spend your evening admiring the beauty of this peaceful town. Overnight in a hotel at Tabo. Today, you'll explore the most popular spots in Kaza. 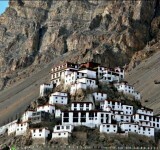 Visit the Key Gompa monastery, the biggest monastery in Spiti Valley located at a height of 13,670 feet. You'll then set foot on Komic village, the highest village with a motorable road in the world. Later, visit the world's highest post office in Hikkim. Overnight in a hotel at Kaza. The next destination of your motorbiking expedition is via the sky-high Kunzum pass on your way to the gorgeous crescent-shaped Chandratal Lake. You'll spend the night in Swiss tents set up a small distance away from the lake. Overnight in Swiss tents at Chandratal Lake. Today you'll complete your motorbiking expedition at Manali. You'll travel through the famous Rohtang pass to reach Manali by the evening. After reaching Manali, you'll handover the bike to the tour operator and check-in to your hotel. Overnight in a hotel at Manali. Check-out from your hotel in the morning and spend the day at leisure in Manali. You can explore the hill-station and visit the shops on Manali Mall road to shop for any souvenirs for loved ones back home. In the evening, you'll board a Volvo bus and reach Delhi the next morning. Overnight in transit. Arrive in Delhi by early morning. Your trip ends here. Board the bus by evening from Delhi. The bus will take you from Delhi to Manali. You are required to carry your own meal and snacks for your overnight journey. Overnight at a hotel in Manali. Spend a day in Manali. You can have breakfast and lunch while exploring Manali at your own expense. You'll be accommodated at a hotel in Manali. Today's meal package includes dinner only. Overnight in Swiss tents in Sarahan. Ride from Manali to Sarahan. You'll be accommodated in Swiss tents in Sarahan. Every day, you'll stop at a restaurant or eatery in the town/villages to buy lunch at your own expense. Today's meal package includes breakfast and dinner only. Overnight in Swiss tents or a hotel in Sangla. Ride from Sarahan to Sangla. You'll be accommodated in Swiss tents or a hotel in Sangla. All accommodation will be in twin or triple sharing rooms. Couples will be given twin-sharing rooms, subject to availability. Today's meal package includes breakfast and dinner only. Overnight in a hotel in Chitkul. Ride from Sangla to Chitkul. You'll be accommodated in a hotel in Chitkul. All accommodation will be in twin or triple sharing rooms. Couples will be given twin-sharing rooms, subject to availability. Today's meal package includes breakfast and dinner only. Overnight in Swiss tents or a hotel at Tabo. Ride from Chitkul to Tabo. You'll be accommodated in Swiss tents or hotel at Tabo. All accommodation units throughout the trip, including the Swiss tents, will come with attached washrooms. Today's meal package includes breakfast and dinner only. Ride from Tabo to Kaza. You'll be accommodated at a hotel in Kaza. Today's meal package includes breakfast and dinner only. Please note that due to the high-altitude, there may be limited availability of services like cellular network or bank ATMs. Spend a day at Kaza. You'll be accommodated at a hotel in Kaza. Today's meal package includes breakfast and dinner only. Please note that due to the high-altitude, there may be limited availability of services like cellular network or bank ATMs. Overnight in Swiss tents in Chandratal. Ride from Kaza to Chandratal. You'll be accommodated in Swiss tents at Chandratal. Today's meal package includes breakfast and dinner only. A support vehicle driven by a mechanic will follow your entourage throughout the trip. Ride from Chandratal to Manali. Today's meal package includes breakfast only. You'll have to buy lunch and dinner at your own expense at any restaurant in Manali. Spend a day in Manali. Board the bus by evening from Manali. The bus ride will take you back to Delhi. You are required to carry your own meal and snacks for your overnight journey. You can hire a public cab/taxi from the Indira Gandhi International Airport at Delhi or the New Delhi Railway Station. Flights and trains to Delhi run with high frequency from most major cities in India.